When in doubt, I always go back to the basics. A pair of boyfriend jeans (can't believe mine still fit me! ), a flowy cardigan and a simple white tank. Easy, comfortable and chic. I hope everyone is having a great week! Good that you match shoes with jeans and t-shirt so well. Love ur Outfit so much! It´s so casual and easy and theese shoes are amazing! love those boyfriend jeans! you are glowing! simple, classic, and chic!!! and i WANT that dainty initial necklace! SO cute!!! Simple. Understated. Classic. So great! aaaahh, so cute! So classic so simple. Love it! I agree, you just can't go wrong with a combo like this! I especially love that delicate little necklace. Aw, love this look Audrey! You look Ah-MAZING! Seriously ... and so funny how you can tell you are having a girl because your belly sits high -- I bet I'm having a boy because my belly is so low. Wish I had snagged those Zara heels when they were still available -- so chic! P.S. Are you wearing maternity jeans yet? woah!! i had no idea you were preggy, my bad for not visiting your blog lately.....congrats babe!!! You look amazing...take care n will check back soon. Great casual outfit! :) Love how chic it is! A simple white tee and boyfriend jeans =a perfect combination ! wonderful look! You style the basics so nicely! You are such a cute mama to be! Kudos to you for still fitting into your bf jeans! Beautiful! You can try BeBand from target. I wore my regular jeans while pregnant and it worked perfectly for me. I seriously absolutely adore this look! From the necklace and wrap to the jeans and heels...perfect! Lovely! I especially like the necklace. My initial for the necklace doesn't show up very well; I'm tempted to get one in my middle name initial. 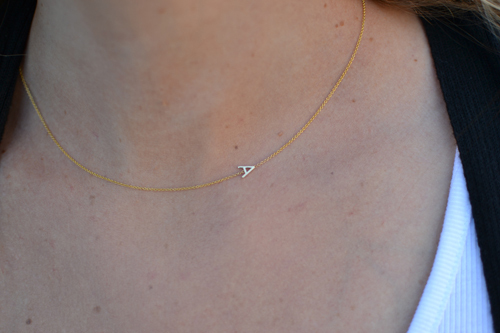 What a lovely initial A necklace! It's quite beautiful. Thank you for sharing.